Creepy Cute Makeup Tutorial « Adafruit Industries – Makers, hackers, artists, designers and engineers! Need another makeup idea for Halloween? 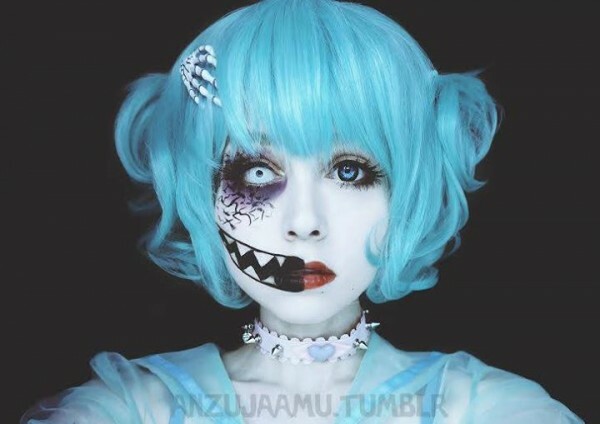 You could follow Anzujaamu’s tutorial for creepy and cute makeup and pair the contrasting look with just about any outfit. The blue wig and dress she wears with the makeup complements it, but the makeup is so interesting that it doesn’t need anything extra. She goes through the steps of applying the makeup and lists all the materials she used, and it only takes eight different items to create the dramatic look. The most expensive part of the makeup is most likely purchasing the contact lenses.